4. No More Bed Making. 5. Hammocks Are Good for Your Health. 7. Making Love in a Hammock. David mostly focuses on the general benefits with emphasis on why you would replace your mattress at home with a hammock (if you plan to do this—and I highly recommend it—check out my Hammock Hang Calculator to estimate where to hang your hammock indoors, how high to place the anchor bolts, if needed, based on the size of your hammock). I want to append David’s list with seven additional benefits when camping or backpacking. You’re off the rocks, roots, and unleveled ground. I don’t know anyone who likes waking up with a rock or root in their back, yet it is the all-too-common complaint of tent camping. That, and sliding to the bottom of your sleeping bag during the night. Your bedding and shelter stays dry and muck-free. One of my pet-peeves with tent camping is the take-down. I hate scraping off wet leaves and debris off the floor, sweeping or shaking out the tent, and drying everything before packing. I can pack and store my hammock separate from my wet tarp. You hang above compacted ground, a potential flood zone. Some campgrounds are so popular the ground is rock-hard. While the area may be flat and debris-free, it’s a flood hazard when it rains. At one camping trip with the Boy Scouts, overnight rains flooded out the tents and only those of us in hammocks stayed dry. I had several hammock converts after that trip. Pitching and packing is quicker (potentially) with less potential for rips, tears, and punctures. Having some Duct tape in your emergency repair kit is always a good idea, but the ability to “float” your shelter above and away from potential puncture hazards means you won’t need to patch that much, or anything. I’ve pitched my hammock over cactus in Arizona and over sharp lava rocks in Southern Utah without worrying about rips or tears. And when it’s time to pack up (or pitch down) I can set up my hammock gear without anything touching the ground. You hang away from nocturnal, creeping critters. Some folks avoid camping because of the threat of spiders, snakes, and lizard tails. But with a hammock, you keep clear from these dangers. During a backpacking trip to Fossil Springs in Arizona, nightfall brought a gaze of raccoons to our camp. When they came to my area looking for loot, they just walked under my hammock and didn’t bother me at all. Maximum air circulation during the hot, muggy summers. I’ve spent way-t00-many summer nights wilting in a “ventilated” tent wishing I had brought a box fan to cool me off. Tents are notorious heat traps, while hammocks benefit from 360° air flow, keeping you cool and comfortable. But watch out: insulate up and get a large, wind-stopping tarp when it gets cold outdoors. It’s a modular shelter system. I wrote all about hammock modularity in my à la carte post, but in a nutshell, hammock camping provides you the ability to mix-and-match gear components to your heart’s delight. Put together a kit that works for you. Good campsites are found, not made. 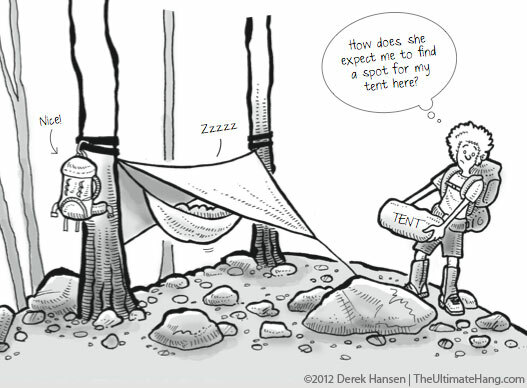 That is great Leave No Trace advice, but the field is wide open for hammocks. Pick a site that is open to the morning sun or a breathtaking overlook. This is take-off from benefit #1 since you’re not as limited by detritus-free, flat ground. True, you can find lightweight tents with carbon-fiber poles and space age material (the same is true of hammocks, of course), but hammocks, by their nature, skip some of the bulky items commonly associated with tents, namely poles. You can also skip the large ground cloth and the extra tent material. Most hammocks are made with uncoated material that stuffs easily (e.g., doesn’t need to be rolled or folded) and can conform to odd spaces in your pack. I recently ventured into the foray of hammock sleeping and can vouch that #1-3 are true. But they cause another problem for me – boredom. I sleep so well compared to tent sleeping that I wake up anywhere from 2-4 am fully rested and ready to go, so I tend to get bored lying there so I have taken to bringing books and reading in the early mornings. Jim, that’s great! I’ll have to add that to the list! Hammocks are great, my Trek Light in particular has given me shelter in a pinch when I didn’t actually plan to sleep where I may have had to! found a place to hang out between games. Recently purchased an ENO hammock and paired it up with my kelty Noah 9′ x 9′ tarp. In related news, I’ve also recently given away my tent, cause ill never use it again. We are renovating a vintage Scotsman trailer into a mobile retail space and need to use every inch for merchandise yet still be able to sleep in it while on the road. We are considering hammocks. Do you think the frame work of an old trailer would hold two adults in hammocks? Sounds like a fun project. I’m not familiar with the construction of that brand of trailer, so you’ll have to find out how structurally sound the frame is, what kind of reinforcements are in place. I don’t know if you’re planning on stripping it down or renovating it, but that would be an opportunity to look at how it is built and where to best place the hammock connections. ANTS abound! Roaches, mosquitoes and the like. Big things fly about, zooning in your ears. Ants, particularly, are a bother. Ant-sticks exist everywhere and if you hang onto the wrong tree, say from an Embaúba”, kid, you’re done. Lukily I got myself a “jungle hammock” specially made with sewn bug-net as one single piece. Even then, the very first time I used it, I woke up (full of wine in my veins, after midnight) with things crawling up and down inside the hammock. I couldn’t believe it! My perfect shelter had been broken into by vile creeters, I thought. Being quite experienced with such ‘imbalances’ I decided I wouldn’t bother and tried to sleep (“they’ll leave me alone if I leave them alone” sort of peace treatee), then,,, to swat the bastards. Got one, two after a lot of doing so I decided to step down and take a look on what was going on. Bid red ants inside. A couple still. And other sorts of unwelcome guests dilligently walking along my cords, tarp etc. For some reason, I think I didn’t close the zippers too well…. A jungle hammock with a zippered bug net in your location would be absolutely essential. For more protection, I would recommend treating your hammock with permethrin, which will keep bugs and ants from approaching. I use atlas eno hammock suspension straps. I have been tying knots for years but I was tired of the stretch in paracord or the messing around with webbing. I am now a convert for using straps,easier ,safer,and always there. That is a good point that a good campsite is found and not made. It would be nice to go out and find a campsite and just set up a hammock there. 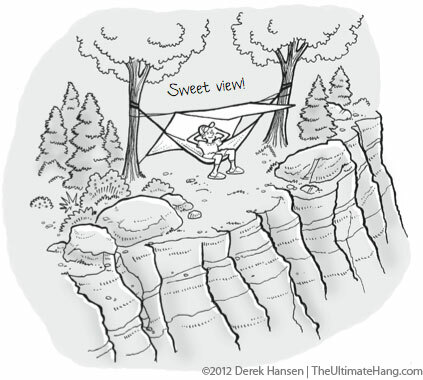 That would be an amazing experience to get a good view at a campsite in a hammock. Maybe I should get a hammock so I can try this out at some point.